The biggest Powerlifting National Championship is at JP’s Gym II, today, where Samoa’s own stars and past world champions are on show. The event also doubles as the trials for this year’s Oceania Games where our Powerlifters traditionally excel. This will be the biggest event in Samoa Powerlifting taking on from last year’s National Championship success. 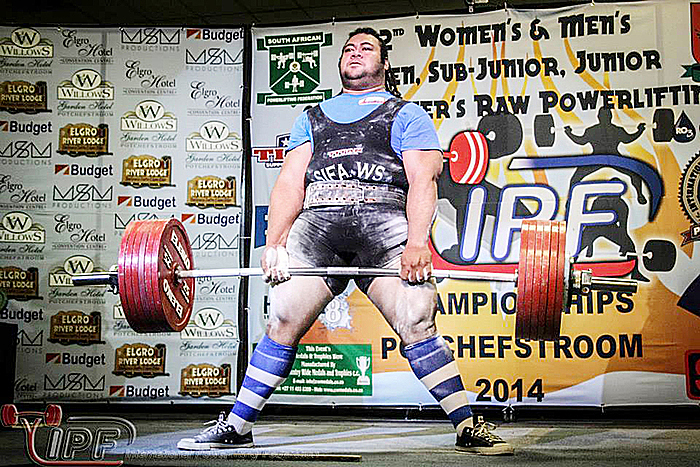 President of the Samoa Powerlifting Federation, Fia’ailetoa Pepe Christian Fruean says ‘The Samoa Powerlifting National Championship 2016 will take the sport another step forward in Samoa. I’m honoured to be a part of this event taking forward the legacy of my late brother Aitken Fruean who instrumental in taking the federation forward and who was a stalwart of International Powerlifting. There’ll be 5 powerlifters taking part in their maiden championship today. Entering this year’s event after claiming a silver medal at the World Championships is Matile Sitagata, who is now a veteran powerlifter at the age of 24. Joining Matile are Oliva Kirisome and Tavian Lipine who respectively were past or current world record holders and Oceania medalists. The Samoa Powerlifting Championships 2016 will be held today, Saturday 24 September 11am at JP’s Gym II at Multiday. Everyone is invited to come and witness the greatest show of strength in Samoa. If you are interested in powerlifting please feel free to call 7293138 on 7261790. Our Mission: To develop and promote the sport of powerlifting and to foster an enjoyable and drug-free experience for the power athletes of Samoa.